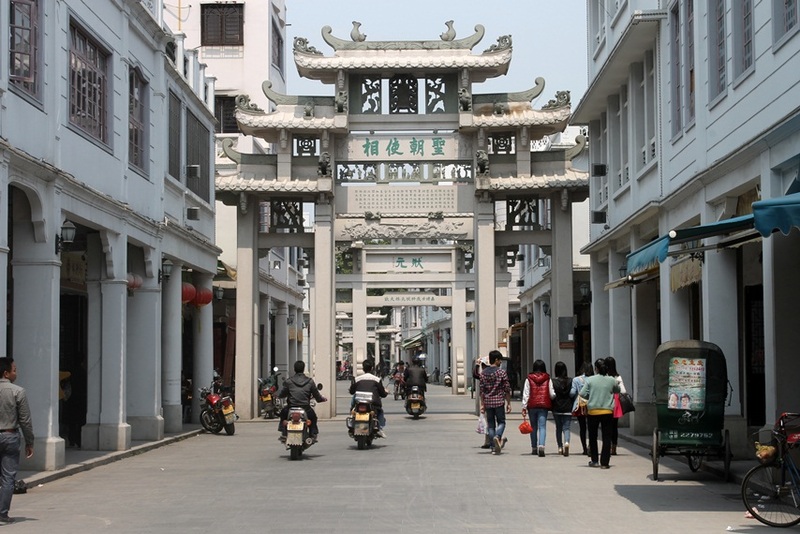 Chaozhou is located in the easternmost part of Guangdong province and it has a population of 2.6 million people. It’s easy to reach from Guangzhou or Shenzhen by 高铁 (high-speed rail). 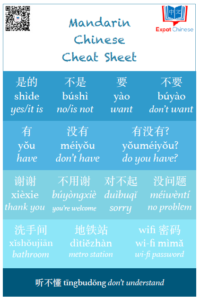 The local language, Chaozhou dialect (or Teochew) is very different from Mandarin Chinese and I found it difficult to understand what older people were saying even when they used Mandarin Chinese. 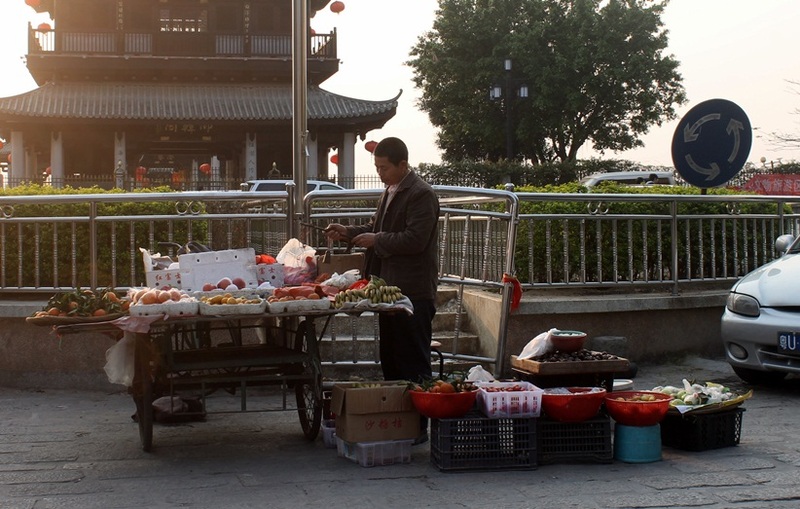 According to friends and readers online, eating is the main event when visiting Chaozhou. Especially seafood, meatballs made of beef and different kinds of snacks. As are pretty much all smaller cities in China, Chaozhou is a chaotic place with motorcycles everywhere. 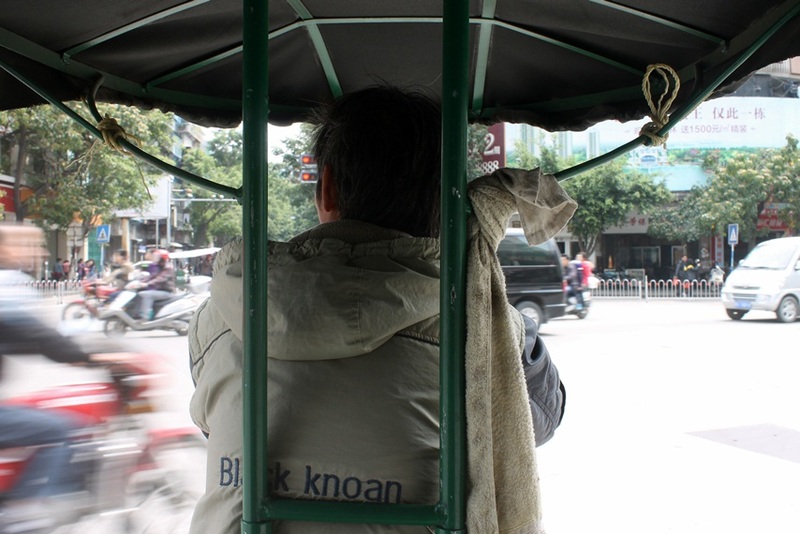 It seemed like all traffic regulations and laws were unheard of no matter if you took a rickshaw (洋车), taxi or bus. You also never know what you can see on the streets, for example I saw three live goats and their owner selling fresh goat milk right outside the hotel I was staying. 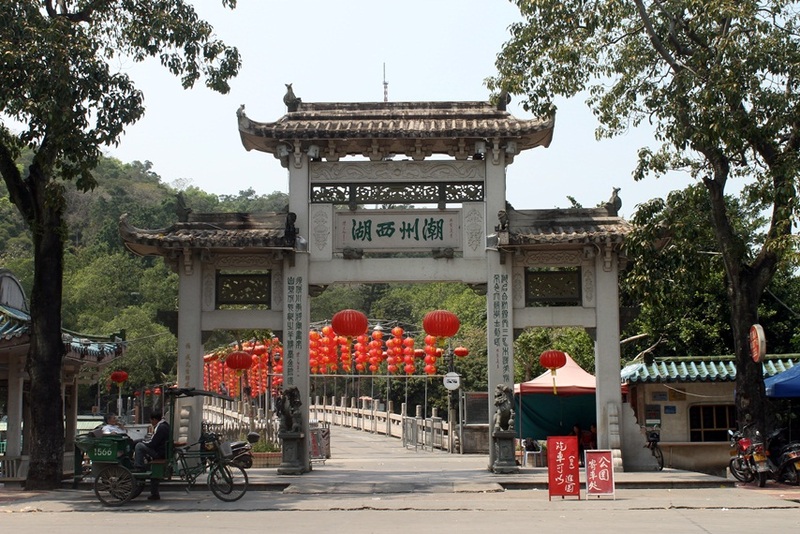 One of Chaozhou’s tourist destinations is the Guangji Bridge (广济桥). The bridge was originally built as a pontoon bridge in AD 1170 and was built to the current form 200 years later. Tourists have to buy a ticket (50-60RMB) to walk on the bridge, but locals can cross it for free (or 5RMB). It’s closed during the night, but the lights make it a great view after the sun goes down. Taking a taxi in Chaozhou wasn’t as easy as in Guangzhou. Taxis were hard to find, especially later hours, and they always refused to use the meter. That’s why I took a rickshaw ride quite a many times during the weekend, which was both fast and cheap. Most of the rickshaws were electric, but I did saw one that required real man power to move. When you are a foreigner, that looks like a foreigner, traveling in China, people will always come up to you for a chat. This time I met a group of students working on their Earth Hour project and got to sign my name on their red banner. I was very impressed that these young students were aware of the Earth Hour and interested in environment protection. I was more than happy to take a group photo with them. Chaozhou is a city for eating and the best place in town is the 牌坊街 (Paifang street). This memorial archway street can be a bit touristy, but at least no other foreigners in sight. The gates are beautiful and along with the 骑楼 (terrace) building on both sides, is a great place for lunch, dinner or evening tea. 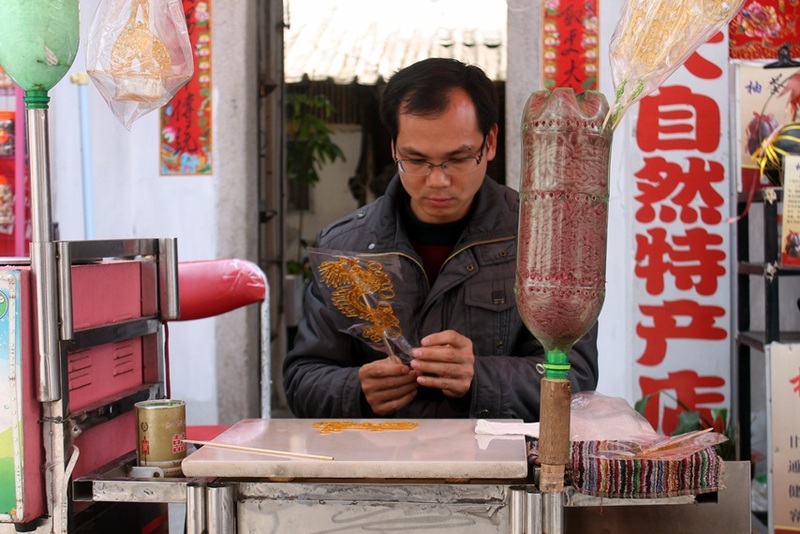 The man in the photo above creates and sells 糖画 sugar paintings. These sugar painting combine a form of folk art and eatable treat. I saw that his beautiful sugar paintings attracted a lot of people gathering around him and watching the process. 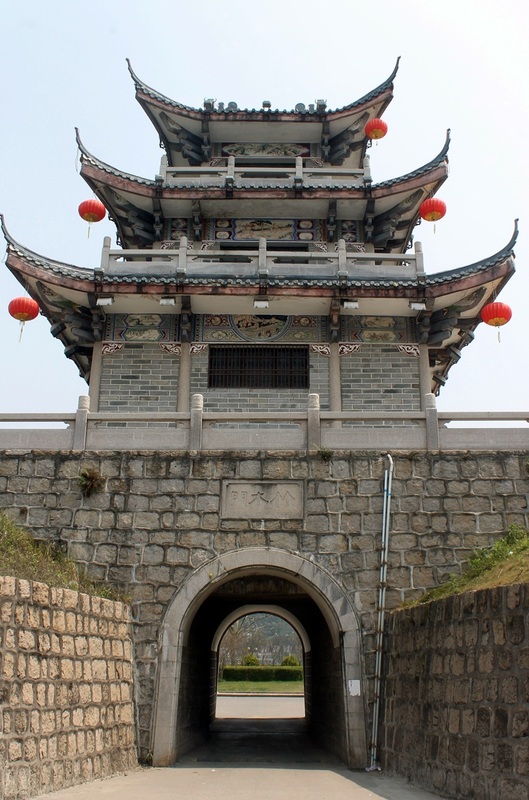 Chaozhou is one of the cities in China that still has a piece of the old city walls left for us to admire. Used for protection back during the emperors times, the ancient city walls are nowadays used as tourists spots in cities like Xi’an. Luckily no tickets were needed to step up the stairs on top of this old city wall originally from the Ming dynasty. 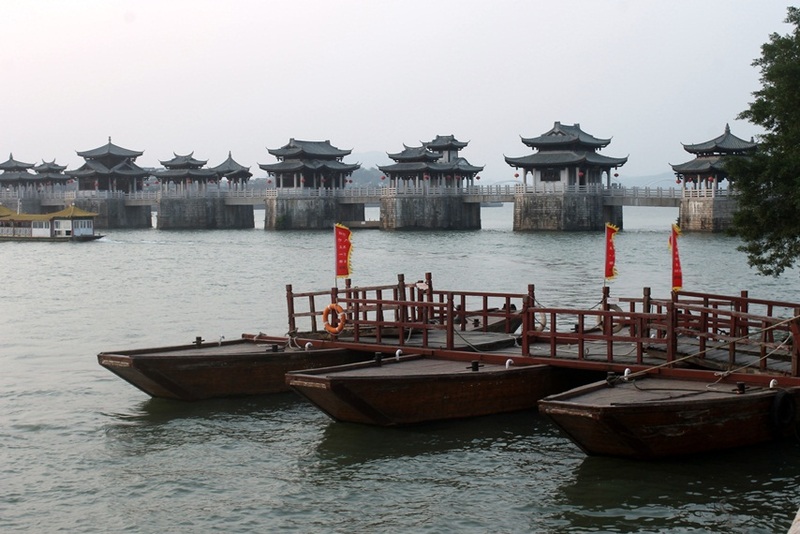 Hangzhou’s West lake is well-known in China, but Chaozhou has its West lake as well. Ticket to this historical park from the Tang dynasty cost only 8RMB and it has paths and pavilions to explore for an hour or two. Visiting Chaozhou reminded me how long it’s been since my last trip which was in August to Jiangxi province with classmates and teachers. Me and my husband have a plan that once our financial situation is better after the renovation and wedding, we want to travel at least twice a year. For our next destination I have proposed hiking in Xishuangbanna, but I have lots of others destinations in mind as well. If you want to learn more about my travels in China, check all of my travel stories here. "Do the things that scare you but feel right"
I’ve got to say, your recent posts have been a great combo of pictures and text. For me, I’m so over writing lately. Thus, this post is a great job of using pictures with some meaningful text explanations. I’m glad to hear you have enjoyed these posts. I’ve got a kind of a writer’s block recently and haven’t written as many posts as I’ve wanted to, but nice to hear the few of them have been good. What a lovely city! I’ve heard of Chaozhou many times but have never made it yet — and your post makes me think I ought to add it to my list of must-visit cities. The cuisine is of course legendary! 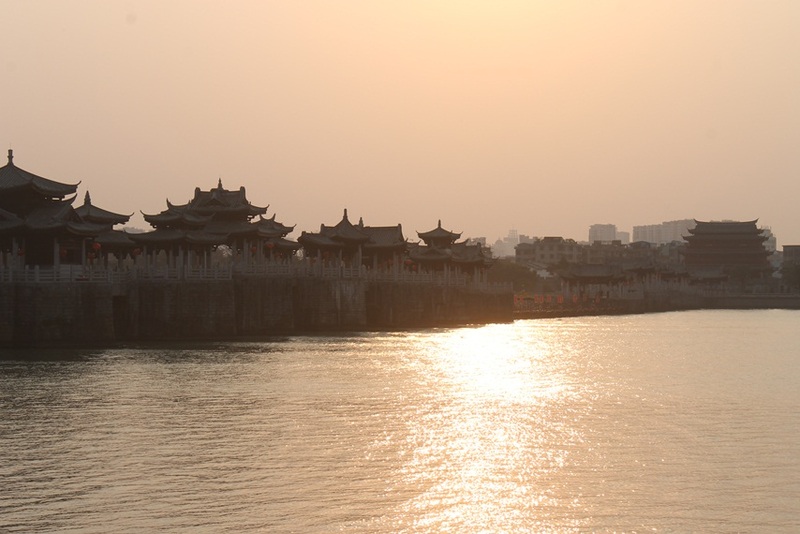 Chaozhou sounds really beautiful and it is nice to see a place that has such wonderful historic locations still intact. I’m glad you enjoyed yourselves and were able get out and have a trip. I think you’d enjoy Xishuangbanna.My husband (then boyfriend) went there a few years ago and had a good time. I still haven’t been to a city in China that I thought boring, always so much to see and explore.